Umbria, is the most central region in Italy, is entirely landlocked and often referred to as being the 'green heart of Italy'. Umbria still loudly echoes the Middle Ages, and boasts (albeit quietly) a landscape of mediaeval hilltop villages, castles and monasteries. 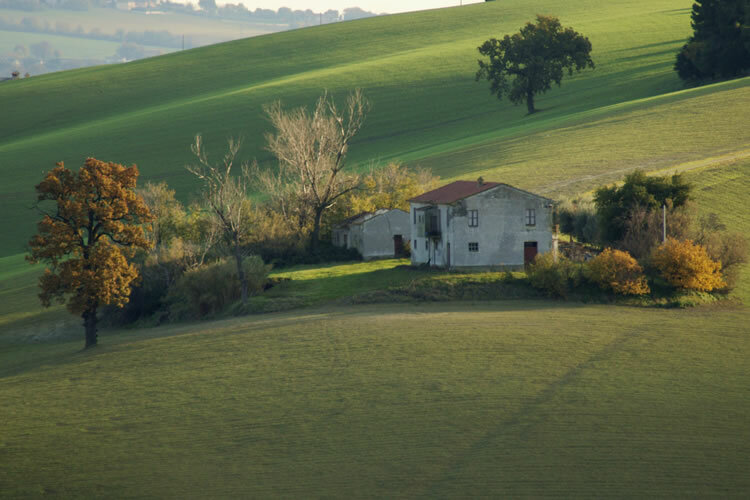 This is a region that, despite being on the doorstep of Tuscany and en route to Rome, is largely untouched by large-scale tourism; there are many bargains to be had, and the countryside and towns will offer up many a sight to match those of neighbouring Tuscany. Perhaps it is the evocative nature of the place, or a certain enchanted air (we might almost say "mystic") that you breathe to some extent everywhere, but sooner or later whoever visits Umbria ends up thinking: San Francesco – Saint Francis -, that great, gentle, tender and poetic Saint of happiness and meekness could only have been born here in Umbria. In this place of ever-green, enchanted and radiant nature. In these towns the concept of "historic centre" seems inadequate and reductive, so widespread is the monumental and artistic component in the towns of Umbria. Perugia, for example, the regional capital. Just to describe it is to lose oneself in the richness, complexity and magnificence of its architectural and artistic treasures: from the Etruscan walls to the splendid Palazzo Gallenga, seat of the antiqu and prestigious University for Foreigners, and many other buildings and historic monuments that lead out from the central Piazza IV Novembre, itself dotted with architectural and artistic jewels such as the Great Fountain and the magnificent Palazzo dei Priori. The same is true for splendid Gubbio, rich with Franciscan memories and monuments from the medieval and renaissance eras. And then Todi, Spello, Spoleto, Orvieto, Città di Castello and many other small towns: all magnificently enriched by monuments, palaces and churches of high artistic merit. Even Terni, a modern industrial city, boasts jewels such as the churches of S. Salvatore and S. Francesco and, close by, the masterpiece of nature that is the Waterfall of Marmore. Finally Assisi, the town where Saint Francis was born (as was Saint Clare, founder of the Poor Clares), one of the best-known Christian destinations frequented by pilgrims. 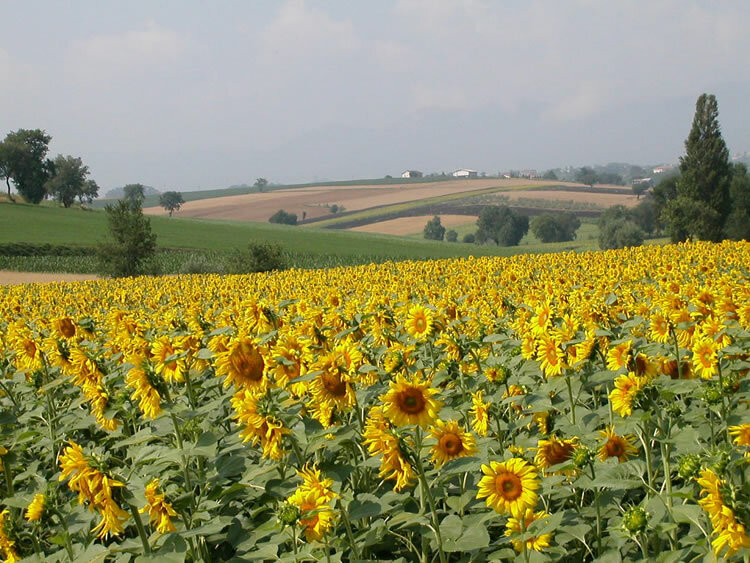 The climatic features of Umbria are those typical of an internal peninsular region.The features of the Meditterranean climate are attenuated because this region is not located beside the sea. The Appenine backbone however forms a barrier against the influxes of the Adriatic Sea. It is rarely exceeded by the masses of cold air originating from the North-East, with consequences also on the distribution of precipitations, which normallly lessen in the East – West direction. The distance from the the Tyrrhenian Sea is greater and a series of hills and low mountains come between the free circulation of air masses. There is therefore a tendence towards continentality, especially in the mountainous areas and in the basins and the directions of the valleys acquire noteworthy importance, causing channeling of winds that overlap general circulation of the area and contribute in the differentiation of transport of humidity and the rainfall regime. The topography, with continuous variations in altitude and orientation, establishes a large variety of microclimates both in the area surrounding Lake Trasimeno, with particularly mild conditions and temperatures during the year, to the Appenine Mountains characterised by cool summers and winters with frequent snowstorms. In most parts of the region, however, very low temperatures are rarely reached, as you can see from the vegetation, which is typical of Mediterranean regions with the presence of species such as the olive that could not support repeated and prolonged very cold temperatures. Total yearly rainfall oscillates around 800 to 1200 mm, with values increasing with altitude. Both the quantity of rain and the number of rainy days are concentrated in the six months of autumn and winter. Minimum rainfall is obviously during the summer months. July is the driest month and long, hot, dry days can be enjoyed from July to September. The Perugia airport is only 20 minutes far from Villa Pieve. We offer shuttle service for our guests. It has a very central, and therefore strategic location, acting both as a north/south crossroads and as a gateway between two seas, the Adriatic and the Tirrenian. 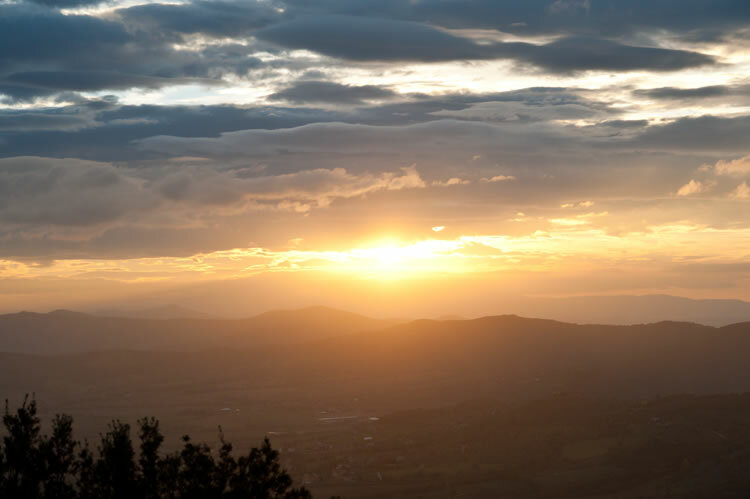 As with many other areas of the country, Umbria has historically integrated and adapted to many diverse cultures, from Etruscans through to Romans, Longobards and on to the Pontifical state and becoming a destination for pilgrims from all over the world. Numerous archaeological finds have unearthed a human presence in Umbria dating back to Palaeolithic and Neolithic periods; flints and arrowheads have been found on several river plains and around the shores of Lake Trasimeno, and burial chambers close to Spoleto date to the time between the Bronze and Iron Ages. At around one thousand years BC a tribe – probably of Indo-European origin – known as the Oscan-Umbrians (Umbri) arrived in the region, establishing many settlements and the foundations of towns and cities such as Terni, Todi, Spoleto, Assisi, Gubbio and Città di Castello. Eventually the Etruscans arrived, forcing the Umbrians to concede much of their territory and to retreat into various central valleys and plains; their was cooperation with the Etruscans, and, many centuries later, the two peoples put up a united front against the might of Rome. Quite who the Etruscans were is far from clear. The three main theories have it that they came to Italy by sea from the Far East, that they came down from northern Europe, or that they are descended from the so-called 'Pre-Italians' of the Bronze Age. They were superlative road builders, they began to clear swamps and marshlands and were great sea-farers, they produced exquisite art works and jewellery, and their tombs and 'cities of the dead' (necropolis) have survived across the centuries and have told much of what is known today. They have shaped Umbria like no other people. They conquered the cities of Umbria, also founding their own, establishing them as autonomous city states with federal agreements between them. 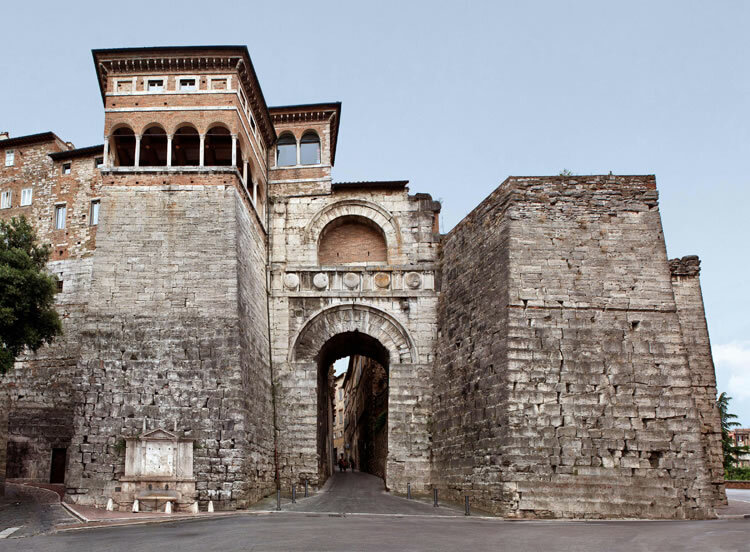 Their tenure is still clearly visible in many Umbrian towns and cities, particularly Orvieto, Perugia and Città della Pieve, where the Etruscan city-scape evolves around ridge-following roads, not around central squares, as with Roman settlements. It was the might of Rome that saw the relatively swift decline of the Etruscan civilisation, and the battle of Sentino in 295 BC saw the Etruscans, alliances notwithstanding, defeated, with all of Umbria falling under the control of Rome. Many Umbrian cities were converted to colonies, avoiding direct confrontation, and, in 90 BC, the Umbrian people are granted the full status or Roman citizenship. Roman rule brought to Umbria a long period of relative peace and increasing cultural and economic prosperity, and, par for the course, an extensive period of construction and modernisation: roads, aqueducts, drainage, villas, theatres and entire new settlements. In common with other areas of Italy, Umbria was subjected to great rack and ruin come the fall of the Roman Empire. The population is decimated by the 'Barbarian hordes', and there is widespread famine and disease. The struggle between Barbarians and Byzantines created a power vacuum that began to be filled by Christianity. By the 4th century there were already 21 distinct dioceses throughout Umbria, and the Bishops came to be the cultural and spiritual figureheads of the region. Umbria was to enjoy a brief period of calm when the Byzantines finally defeated the Goths in 522, this lasting until the Longobards arrived and took possession of large parts of eastern Umbria, eventually establishing the Duchy of Spoleto. The Duchy achieved a large degree of autonomy, and the prosperity gained ensured that that it survived well beyond the end of Longobard rule. Having been donated by Pippin the Short (no, really) and Charlemagne, the Umbrian territories, including the Duchy of Spoleto, were passed to the church. With the fall of the empire of Charlemagne, Rome and the church consolidated their position, formally declaring Umbria to be part of the Papal State. In common with much of the rest of western Europe, many independent city-states were formed in Umbria at the beginning of the 11th century. The region flourished, and there were increases in both prosperity and population, with merchants and artisans acquiring respect and positions of authority. The continuing history of Umbria, up until the 16th century, is marked by internal conflicts and sparring (notably Guelph versus Ghibelline) alongside steady economic, artistic and spiritual growth. The region was a centre of learning courtesy of numerous Benedictine and Franciscan monasteries, and the University of Perugia was established in 1308. The Papacy 'took' Umbria in the 16th century, with Perugia, the main city, being the last to fall in the year 1540. Umbria was briefly help by France from 1798 to 1800 and again later from 1808 to 1814, after which it again reverted to Roman rule. Several anti-Papacy revolts later, Umbria joins the Italian state in 1860. The twentieth century saw Umbria embracing the Industrial Revolution, with Todi being dubbed the 'Manchester of Italy'. Various areas were heavily damaged by WW2 bombing, and extensive urban reconstruction was undertaken. Umbria today is an increasingly popular tourist destination, with the wonders of the Etruscans mixing in alongside those of Ancient Rome and the splendid array of mediaeval towns and hilltop villages.